The principal result of the European Council meeting of 19-20 October 2017 was the endorsement of the ’Leaders’ Agenda’ setting out the main issues and work-plan for the European Council up to June 2019. EU leaders also agreed on changes to the working methods of the European Council itself, including a more ’political approach’ to its discussions, enabling more direct engagement on politically sensitive issues, more ‘rigorous follow-up’ to European Council meetings and decisions, and an increase in the frequency of meetings, if needed. The EU Heads of State or Government also took stock of progress in the implementation of EU migration policy, recognising the significant contribution made by Italy in the Central Mediterranean and committing to ensure sufficient funding to stem the flow of illegal migrants from Africa. They adopted detailed conclusions on Digital Europe, including on cybersecurity and e-Government, before welcoming the significant progress in preparing Permanent Structured Cooperation (PESCO) in defence. EU leaders also discussed developments in North Korea (DPRK), as well as the situation in Iran and in Turkey. EU-27 leaders met on 20 October in a separate formal European Council (Article 50), without the United Kingdom, to discuss the latest developments in the latter’s withdrawal negotiations. While postponing the decision on starting the second phase of negotiations on the EU’s future relations with the UK, due to insufficient progress made to date, EU-27 leaders called for further work to consolidate the convergence of EU-UK views and to be able to move to the second phase of negotiations as soon as possible. They will reassess the state of progress in the negotiations at the next meeting of the European Council (Article 50), in December 2017. Jüri Ratas, Estonian Prime Minister and President-in-Office of the Council, provided an overview on the progress made in implementing previous European Council conclusions. The follow-up to new commitments made at this European Council meeting (see Table 1) will be reported on at future meetings. EU leaders reiterated their determination to pursue the EU’s comprehensive migration policy and to remain vigilant on all migration routes. This policy includes, in particular, the coordinated use of all available EU and Member State instruments, support for Member States directly affected or involved, and strong cooperation with international partners as well as with countries of origin, transit and departure. It also implies reducing incentives for illegal migration as well as the provision of adequate financial and other resources. EU Heads of State or Government recognised the significant contribution made by Italy on the Central Mediterranean route and pledged to support Member States’ efforts to stem the flow of migrants and increase returns. In this context, they also reiterated the importance of working with Libyan authorities and neighbouring countries, urged support for UNHCR and IOM efforts in Libya and the region, and called for increased efforts to establish a permanent EU presence in Libya. With the aim of addressing the root causes of migration, EU leaders welcomed the recent launch of the European Fund for Sustainable Development, and the implementation of the Economic Resilience Initiative of the European Investment Bank (EIB). EU leaders also committed to providing sufficient funding for migration-related action in North-Africa, notably through the North Africa window of the Trust Fund for Africa. On this issue, the European Commission’s President, Jean-Claude Juncker, emphasised that the EU has reached the limit of financial support that it can re-allocate from the existing EU budget (currently €3.1 billion), and stressed his view that the combined Member States’ contribution of €175 million ‘is clearly not enough’. The European Council welcomed the progress achieved so far on the reform of the Common European Asylum System and called for further convergence towards an agreement in the first half of 2018, which would strike the right balance between responsibility and solidarity. EU leaders also reiterated their commitment to the Schengen system and expresses their intention to go ‘back to Schengen’ as soon as possible, while taking the proportionate security interests of Member States fully into account. The European Council confirmed its commitment to work towards ‘a strong and coherent’ Digital Europe. It endorsed the conclusions of the Estonian Prime Minister following the Digital Summit of September 2017 and emphasised the need for a future-oriented regulatory framework enabling the EU to fully embrace the digital era. For this purpose, the EU must speed up and prioritise work towards the completion of the Digital Single Market (DSM) by end-2018. EU leaders reiterated their call for EU institutions to advance rapidly on pending legislative files, and for the Member States to implement EU legislation, so as to provide tangible results for citizens and businesses. In order to move forward and overcome deadlocks at the Council of Ministers level, EU leaders announced that, ‘the European Council will at its level address issues that cannot be solved at the level of the Council’. The Parliament, in its resolution of 16 February 2017 on ‘improving the functioning of the European Union building on the potential of the Lisbon Treaty’, criticised the fact that, due to Council’s limited use of qualified majority voting (QMV), legislative matters are too often referred to the European Council, and called upon the Council to ‘abandon the practice of transferring contentious legislative fields to the European Council’. In addition to general strategic directions on Digital Europe, the European Council gave detailed guidelines on priority areas of action, some of which have a specific deadline (see Table 1 above), with the aim of promoting operational follow-up. In line with its previous conclusions, the European Council recalled the importance of building high-quality infrastructure and communications networks (5G and increased spectrum coordination by 2020), of enhancing digital skills and of digitalising the public sector, in accordance with the Tallinn Ministerial Declaration on e-Government. EU leaders also underlined the need for resolute R&D and investment efforts, as well as the urgency of developing an EU approach to emerging trends, such as artificial intelligence and blockchain technology. Moreover, the European Council stressed the importance of ensuring a global level-playing field in taxation of the digital economy, and called for work to be pursued on the basis of corresponding proposals to be submitted by the European Commission by early 2018. Furthermore, EU leaders underlined the need for a common and proactive EU approach on cybersecurity, insisting on timely delivery and examination by the Council of the relevant European Commission proposals. Finally, the European Council called for the intensification of action on combatting terrorism and online crimes, and expressed its support for adopting appropriate measures at EU level. As expected, the Heads of State or Government praised the progress achieved since June 2017, when they called for the establishment of an ‘inclusive and ambitious’ Permanent Structured Cooperation (PESCO) in defence (Articles 42(6) and 46 TEU, and Protocol 10) and encouraged Member States in a position to do so, to swiftly notify their intention to participate in PESCO. They invited the co-legislators to rapidly finalise the legislative procedure on the European Defence Industrial Development Programme (EDIDP), with the aim of financing the first capability projects in 2019. Whilst welcoming the launch of the first trial run of the Coordinated Annual Review on Defence (CARD), EU leaders stressed its potential, in conjunction with PESCO and the European Defence Fund (EDF), to enhance defence cooperation among EU Member States. The European Council will revert to this topic in December 2017, when it is expected to assess progress made on the commitments undertaken at its December 2016 meeting. The European Council held a debate on relations with Turkey. Although not explicitly mentioned in the text of the conclusions, European Council President Donald Tusk stated in his post-summit remarks that EU leaders had tasked the Commission with examining whether or not to cut or reorient pre-accession funds to Turkey. German Chancellor Angela Merkel had also declared in a press conference that Member States agreed ‘to cut pre-accession aid in a responsible way’. Furthermore, President Tusk added that Turkey had to respect all Member States in its relations with the EU, including with regard to the implementation of the existing Customs Union. In July 2017, the European Parliament had called for the freezing of accession negotiations, given extensive repressive measures taken by the Turkish government against political opponents since the failed military coup in 2016. Given current escalating tensions on the Korean peninsula, EU leaders called on the Democratic People’s Republic of Korea (DPRK) to fully comply with its obligations under UN Security Council resolutions and abandon its nuclear and ballistic missile programmes. The European Council intends to consider future responses, whilst the EU will continue to reach out to third countries urging full implementation of UN sanctions. The Foreign Affairs Council adopted new measures against the DPRK on 16 October 2017. The European Council also reaffirmed its full commitment to the Iran nuclear agreement, and endorsed the statement by the Foreign Affairs Council of 16 October 2017, calling for the full and effective implementation of the agreement by all parties. The European Parliament’s President, Antonio Tajani, underlined the importance of maintaining the nuclear agreement with Iran, and called for all ‘diplomatic energies [to be used] to ensure that the agreement in its current form is safeguarded’. While not featuring on the annotated draft agenda, the future of Europe, in particular the related forthcoming work in the European Council, ended up as a central issue at this European Council meeting. The reflection process on the future of the EU-27, which was launched after the June 2016 UK referendum on EU membership, led to the Bratislava declaration and roadmap, and the Rome declaration. More recent contributions to this debate featured the 2017 State of the Union address by Jean-Claude Juncker and Emmanuel Macron’s September speech at the Sorbonne. In his address, the EP President, Antonio Tajani, recalled that ‘Parliament was the first to contribute to this reflection process, through the Brok-Bresso, Böge-Bérès and Verhofstadt reports’, and invited Heads of State or Government to come to the Parliament to debate the future of Europe. The Heads of State or Government of the EU-28 unanimously adopted the Leaders’ agenda, prepared by the European Council President, Donald Tusk, following the leaders’ informal discussions on 29 September 2017 in Tallinn. The ’Leaders’ Agenda’ defines the main issues and sets out the work-plan for the European Council up to June 2019 (see Table 2). President Tusk reiterated that the European Council’s work should be guided by three principles: i) finding practical solutions to EU citizens’ real problems; ii) using a step-by-step approach; and iii) preserving unity. He also indicated that ‘the social dimension will be an important part of this new agenda’. The President of the European Parliament, Antonio Tajani, pointed out that ‘one of the items on the Leaders’ Agenda foresaw a discussion on the Spitzenkandidaten’ and expressed his conviction that Head of States or Governments would ‘aim … to make that arrangement the norm’. As flagged up in the EPRS outlook before the event, Heads of State or Government also agreed to meet more frequently over the coming months to discuss topics relevant to the future of Europe, either in formal and informal European Council meetings, in EU-27 or EU-28 format, in Euro summits, or in wider formats, such as the Social Summit in Gothenburg on 17 November 2017. 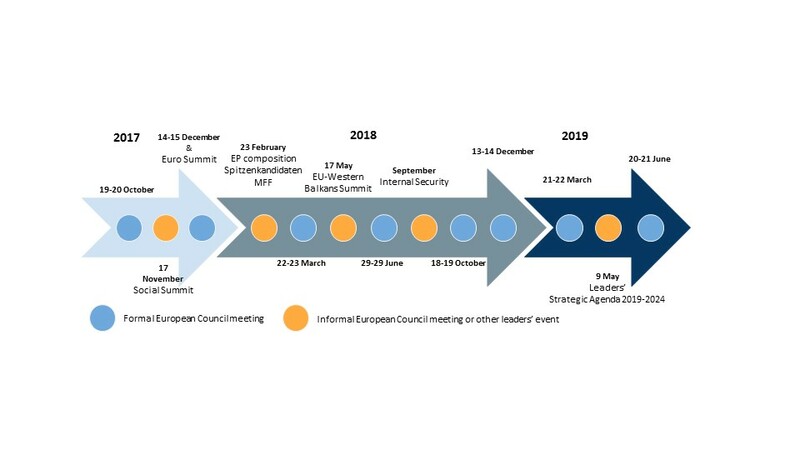 Following this European Council meeting, the Leaders’ Agenda currently plans 12 meetings of EU Heads of State or Governments in different formats and with specific agenda points up until June 2019 (see Annex). President Tusk has already indicated that the Leaders’ Agenda is a living document, which will ‘have to be updated and enriched’ as discussions progress. The Heads of State or Government also endorsed suggestions to revise the European Council’s working methods by – in the words of its President, Donald Tusk – ‘taking things into [their] own hands’. The purpose is to accelerate EU leaders’ work, by proposing a more ’political approach’ to their discussions, which would enable them to engage ‘more directly on politically sensitive issues’ with the aim of overcoming deadlock in the Council of Ministers or finding solutions to key political files. Therefore, future discussions will be based on ‘Decision Notes’ put forward by the European Council President ahead of meetings, which will set out the political problems to be solved and describe precisely the scope of any conflict, to allow a more focused political discussion. If a first discussion does not lead to a resolution of the problem, the Heads of State or Government will decide whether to try again, or if a group of Member States could advance independently by resorting to enhanced cooperation. Another adjustment to the working methods will be to further develop the practice of ‘implementation reports’ assessing the state of play on previous decisions of the EU leaders, providing a better basis for EU leaders to draw political conclusions for their work. As a first example of this new approach, the European Council discussed the implementation of the Bratislava Roadmap, which was adopted at the informal meeting of 27 Heads of State or Government in Bratislava on 16 September 2016, and later broadened in scope by the Rome Declaration of 25 March 2017 (see the EPRS in-depth analysis ‘From Bratislava to Rome’). The ‘Bratislava implementation report’ indicates which tasks have been completed or are on track, where further efforts are needed, and where progress has been insufficient. * Issues requiring discussions to resolve a deadlock or finding solutions to key political files are presented in blue text. (1) Until March 2019, there will also be regular meetings of the European Council in the Article 50 format (EU-27) to deal with the Brexit negotiations. The President of the European Parliament, Antonio Tajani, raised the issue of the assassination of the Maltese investigative journalist, Daphne Caruana Galizia, who was killed on 17 October 2017. Expressing the Parliament’s solidarity with her family, and with journalists in general, he called for an international inquiry to be carried out into this murder, a suggestion which received full support from the Heads of State or Government. The Parliament President also informed the members of the European Council that the Parliament will discuss this matter at its next part-session, on 24 October 2017. Although not officially on the agenda, a discussion took place at the request of French President Emmanuel Macron on the scope and pace of ongoing and future trade negotiations, in particular those with Mercosur (Argentina, Brazil, Paraguay, and Uruguay). In a letter of 4 October 2017, France, along with seven other EU Member States, had expressed concern over the impact that the Mercosur agreement would have on the EU agricultural sector, with regard to products such as beef, ethanol, sugar and poultry. Commission President Jean-Claude Juncker emphasised during a press conference on 20 October 2017 that the agreement with Mercosur was important to the EU and that negotiations should be concluded by the end of the year, in full compliance with European standards and in a spirit of reciprocity. The European Commission President, Jean-Claude Juncker, reported that the European Council also discussed the wildfires in Portugal and Spain, and that the Commission proposed to utilise all available EU instruments to show solidarity to these countries, as well as to the Baltic States which had suffered from floods recently. He announced that the Commission would present a global proposal on ‘civil protection’ in a month’s time. The importance of setting up a European initiative to intervene in cases of natural disasters was also highlighted by President Tajani. The issue of Nord Stream 2, a gas pipeline planned to run from Russia to Germany under the Baltic Sea, was also mentioned at the meeting, due to the blockage on the issue in the Council. On 9 June 2017, the Commission asked the Council for a mandate to negotiate a special legal framework with Russia for the operation of the Nord Stream 2 gas pipeline project, since the Commission and Council legal services had established that the 2009 EU Gas Directive did not apply to a pipeline crossing an external border. On 8 November 2017, the Commission is expected to propose an amendment to the third legislative energy package in order to clarify the regulatory framework for gas pipelines from third countries. Commission President Jean-Claude Juncker stated in a press conference on 19 October 2017 that the ‘Commission still thinks it is useful for it to have a negotiating mandate with Russia’. The situation in Spain following the referendum held on 1 October 2017 by the Spanish autonomous Community of Catalonia, asking whether Catalonia should become an independent state, was briefly mentioned during the dinner and at the press conference following the meeting. When asked about the situation, European Council President Donald Tusk stated that ‘there is no room for mediation or international initiative or action’, and added that ‘there is no space for EU intervention here’. The EU’s chief Brexit negotiator, Michel Barnier, briefed the 27 members of the European Council (Article 50) on the outcome of the fourth and fifth negotiating rounds. He expressed the view that the latest rounds had been more ‘constructive’ but still fell short of ‘achieving sufficient progress’. While welcoming the progress made regarding citizens’ rights, and acknowledging that, as regards Ireland, there has been some progress on convergence of principles and objectives, the European Council (Article 50) did not recommend the opening of the second phase of negotiations on the EU’s future relations with the UK. EU-27 leaders noted that, ‘while the UK has stated that it will honour its financial obligations taken during its membership, this has not yet been translated into a firm and concrete commitment from the UK to settle all of these obligations’. President Tajani recalled the Parliament’s position, welcoming ‘the constructive approach adopted by Mrs May in her address in Florence’ while agreeing that, so far, ‘insufficient progress has been made’. The European Council called ‘for work to continue with a view to consolidating the convergence achieved between the two negotiating parties and pursuing negotiations in order to be able to move to the second phase of the negotiations as soon as possible’. At its next meeting in December 2017, the European Council (Article 50) ‘will reassess the state of progress in the negotiations with a view to determining whether sufficient progress has been achieved’. If so, it will adopt additional guidelines in relation to the framework for the future EU-UK relationship and on possible transitional arrangements. Against this background, the European Council (Article 50) invited the Council (Article 50), together with the Union negotiator, to start internal preparatory discussions. Jüri Ratas, Estonian Prime Minister and President-in-Office of the Council, reported to EU-27 leaders on discussions regarding the relocation of the two UK-based EU agencies, the European Banking Authority (EBA) and European Medicines Agency (EMA). The Council is expected take a final decision on the relocation on 20 November 2017. Read this briefing on ‘Outcome of European Council meeting of 19-20 October 2017 and the European Council (Article 50) meeting of 20 October 2017‘ on the Think Tank pages of the European Parliament.